"We are reducing today the size of the editorial team by approximately 50 percent and re-focusing much of our talent on breaking news -- especially in areas of crime, civil justice and public responsibility," read the email, which was obtained by CNN. "We know our readers look to us for a unique point of view, and we believe these topics offer our best opportunity to differentiate our reporting. We will, of course, continue to cover local news, sports and other events, but our approach will evolve as we adapt to our current environment." The email said the employees "exiting the business will leave immediately," although "they will continue to be paid for the next 90 days and be eligible for transitional benefits after that." A Tronc spokesperson did not respond to a request for comment. Among those leaving will be a pair of newsroom leaders: editor-in-chief Jim Rich and managing editor Kristen Lee. Rich will be replaced by Robert York, the publisher and editor of The Morning Call, a Tronc-owned daily newspaper in Allentown, Pennsylvania. Tronc added the Daily News to its hefty portfolio of newspapers last year after it was sold by the tabloid's longtime owner, the billionaire Mort Zuckerman. Zuckerman had tried unsuccessfully to sell the paper for years. In a sign of the tabloid's faltering economic health, it was sold for only $1. The Daily News has a towering legacy in New York City media, serving as the home of the late Pulitzer Prize-winning columnist Jimmy Breslin and famed sportswriter Mike Lupica. It distinguished itself from its chief rival, the New York Post, with a populist ethos that has long appealed to the city's working class. In recent years, the Daily News became a crusader for gun control, running provocative covers in the wake of mass shootings. Rich told CNN in a 2015 interview that the goal behind any Daily News cover is to "give you that punch in the gut." News of the layoffs on Monday was met with sadness from fellow journalists and New York officials. The state's governor, Andrew Cuomo, said that the cuts "will undoubtedly devastate many households and hurt an important New York institution and one of our nation's journalism giants." "These layoffs were made without notifying the State or asking for assistance...I urge Tronc to reconsider this drastic move and stand ready to work with them to avert this disaster," Cuomo said in a statement. "I understand that large corporations often only see profit and dividends as a bottom line. But in New York, we also calculate loss of an important institution, loss of jobs, and the impact on the families affected. I hope Tronc does the same and recalculates its decision. New York State stands ready to help." New York City Mayor Bill de Blasio also weighed in with a tweet after news of the staff cuts. "It's no secret that I've disagreed with the Daily News from time to time. But Tronc's greedy decision to gut the newsroom is bad for government and a disaster for NYC," de Blasio said. "Tronc should sell the paper to someone committed to local journalism and keeping reporters on the beat." 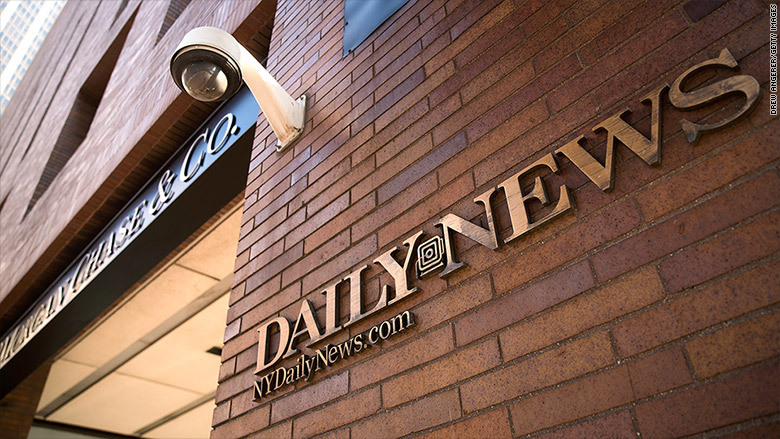 Like so many other print publications, the Daily News has battled faltering advertising revenue amid a transition to a digitally centric media landscape. The paper reportedly lost $90.4 million over the last three years. Rumors of layoffs have swirled for the last several days, but official confirmation came on Monday. Staffers gathered for a brief meeting at 9 a.m., where they were told by Tronc executive vice president and general manager Grant Whitmore to check their emails for news about restructuring. The waiting game commenced, but going into the meeting, Daily News staffers had already braced themselves for the worst. "Mood has obviously not been good," said an editor. "Everyone on edge." One reporter said while he had "no inkling of what's going to happen," he understood it was "not going to be good." Within ten minutes, the email arrived as promised. "I know this is difficult news to hear and want to assure you we are working hard to treat each employee with respect and to make the transition as smooth as possible," the email said. "I hope you will all join me in thanking our departing colleagues for their many contributions to the Daily News and wishing them well in their future endeavors," it continued. "The decisions being announced today reflect the realities of our business and the need to adapt an ever-changing media environment. They are not a reflection on the significant talent that is leaving today. Let there be no doubt: these colleagues are highly valued and will be missed." Whitmore then met with senior staffers, with whom he shared the new organizational chart, a copy of which was obtained by CNN. The chart revealed that the sports desk is down to nine staff members and the visuals department is down to seven; one staff member who saw it said they had both been "eviscerated." The staff member also expressed relief that there are "a lot of good reporters who aren't getting axed," but acknowledged that the losses will be recognized by readers. "I'm sure people will feel it in the paper," the source said. "They'll see what's missing." The source expressed frustration with the paper's ownership, but said that some of the problems predate Tronc's acquisition of it. "Tronc's incompetence is real, and nobody has any faith that they have a strategy," the source said. "At the same time, I have to say honestly, if this were still Mort Zuckerman's paper, we would possibly be in the same place. He was figuring out what to do with losses." Appended to the chart was a questions-and-answers sheet "intended to be used by Editorial Leadership in conversations with their teams." The sheet revealed that leadership "has been working on this plan for roughly two weeks." "The decision was a difficult one and some adjustments were being made as recently as the end of last week," it said. The sheet also said that Rich and Lee "each decided it was the right time to move on to a new challenge," and that Monday's decisions were driven "by Grant Whitmore...in consultation with others at the Daily News and tronc." Laid off employees were told of their fate in small groups, while remaining staffers had meetings with human resources. By noon, most of the fired employees had left the newsroom, where they were "clapped out," continuing a longstanding Daily News tradition of showering departing colleagues with applause on their way out the door. The day began with an ominous tweet from Rich, who served as the paper's top editor for about a year before taking a job as executive editor at HuffPost in 2017 and only returned to his post at the Daily News in January. Rich did not respond to a request for comment. The New York Post reported late last week that Rich had a lengthy meeting with Tronc executives earlier this month and "balked at making the sweeping cuts that management was demanding." "If you hate democracy and think local governments should operate unchecked and in the dark, then today is a good day for you," Rich tweeted early Monday morning. There are no news outlets or job titles listed in his Twitter bio, which now simply says: "Just a guy sitting at home watching journalism being choked into extinction." Correction: A previous version of this story incorrectly reported the name of the editor in chief who is leaving the Daily News amid the staff cuts. The editor's name is Jim Rich.